Who do I trust when dealing in Security? But Wall Street Journal story “The Mistakes You Make In a Meeting’s First Milliseconds” has a communications coach saying that you should not always trust your first impressions. And there is a way to repair a potential impression made. With data and computer networks in a corporate setting we are dealing with a different trust relationship than personal relationship trust. 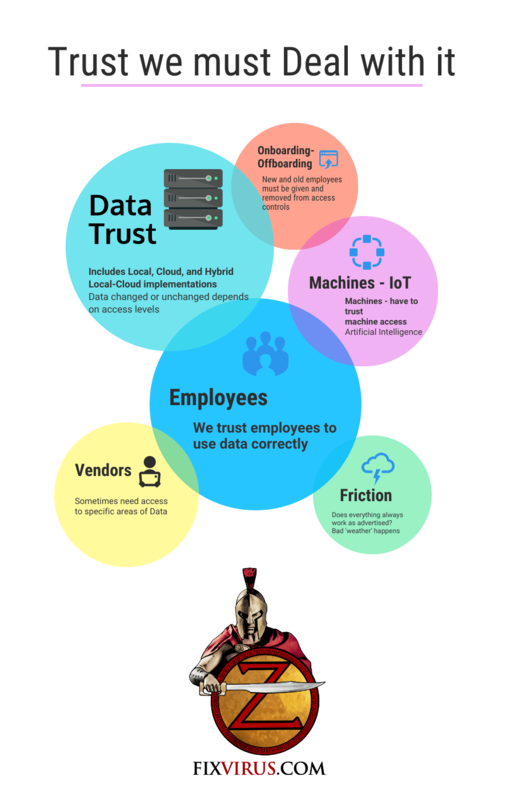 Data Trust — Local network trust, cloud network trust, hybrid cloud(a local and cloud solution) The data is trusted to be unchanged or changeable depending on access levels. Where data is located and how it is managed makes a difference. Employees — Some employees should not have access to finance or computer administrative functions. It is a security failure to give too much access to employees even though it may make function easier in short run. Machines-IoT — Unfortunately even machines need some access, depends on the automated process, and this area will get trickier as more AI(Artificial Intelligence) becomes prevalent. Vendors — Sometimes need special areas of access, but not too much. Offboarding-Onboarding – When new employees are brought on and old employees removed from the systems we need to have our systems in place. Friction — Everything we do is not always 100% accurate, so we must prepare for the times of inaccuracy. Bad weather happens, storms come and go, so do errors. It is the job of the Security professional to lead a company into defining data security and preservation needs. We can help with this security issue of utmost importance. It includes compliance where in HIPAA privacy of patient records are paramount, and in PCI standards where no Credit Card information numbers are allowed to be stored without encryption, and preferably not stored at all. 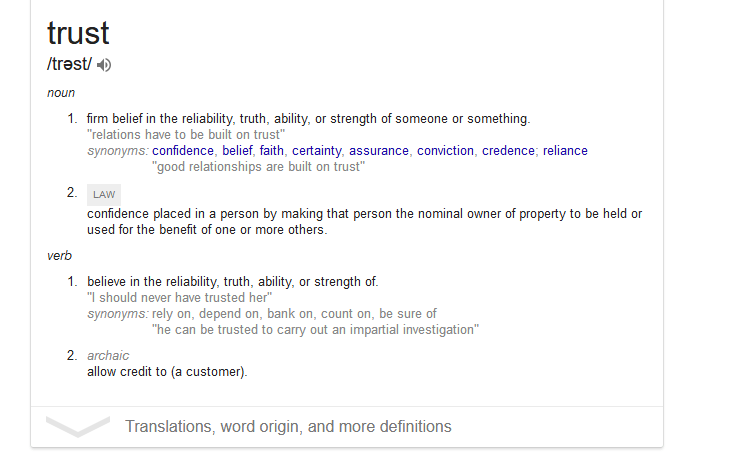 There are other aspects of trust – government trust, currency trust, physical security trust, and personal trust (spouse, family, and friend). What I want to say in this space is that cybersecurity actually affects all trusts, and the new Cryptocurrency is upending some of the government and currency trusts. Although Cryptocurrencies are interesting as to how they create trust, as the trust is not in a central bank (or the government) but in individual decentralization trust. One thing is obvious in 2018 and beyond we will be using digital means and will affect our lives more than ever. So get cracking … fix your Cybersecurity now, before the hackers review it first. Contact US to review your situation.